Bike Spoke Lights - 2 pk - 2/$5 Or 4/$8 Ships FREE!! You are here: Home / Great Deals / Bike Spoke Lights – 2 pk – 2/$5 Or 4/$8 Ships FREE!! Bike Spoke Lights – 2 pk – 2/$5 Or 4/$8 Ships FREE!! Safety first! No matter what your evening fitness regimen, you need to be seen by oncoming cars. 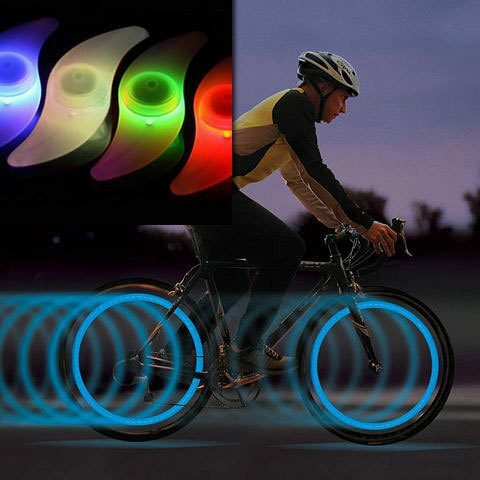 Get these Bike Spoke Lights – 2 pk – 2/$5 Or 4/$8 Ships FREE for an added safety feature!! There is a flashing and a solid ON mode and creates a fabulous ring around your tire! Use it for bikes, or motorcycles. Installs in seconds on your tire spokes!